Dartford tolls suspended - in rush hours | What Car? 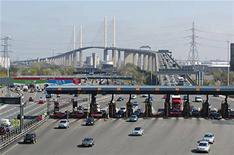 Congestion at the Dartford Crossing could be cut from today, with start of a new Government-backed trial. The six-month experiment will result in the suspension of tolls at times of severe congestion. Car drivers also face toll increases of up to 66% as the Government seeks to raise the 1.7 billion needed to fund extra crossing capacity. It wants to raise the cost of crossing from the current 1.50 to 2 by the end of 2011 and to 2.50 in 2012. The Dart-Tag fee will rise from 1 to 1.33 in 2011 and 1.67 in 2012. Other measures to improve the flow of traffic will include the use of automatic numberplate recognition for pre-paying users from 2013. More than 50 million vehicles use the crossing each year an average of 137,000 per day. It was designed with a capacity of 135,000 vehicles per day.